AnchorCert Gem Lab Gemmologists are all highly qualified and experienced. They maintain their expertise by undertaking continual professional development through a range of recognised formal and practical training courses. Their expertise in the identification of diamonds, precious gems and pearls is unrivalled. All Diamonds, Gemstones and Pearls arriving at AnchorCert Gem Lab may be loose or mounted. They are all given a unique barcode number and photographed on receipt. Loose diamonds are weighed to three decimal places, and mounted diamonds are measured precisely using either a Presidium gauge, Schindler or C-Master gauge. An accepted formula will then be applied to estimate their weight to within a tolerance of five per cent of the true weight. For very small stones a Meleemeter gauge may be used. Once the weight has been recorded, all diamonds undergo a screening test on the ‘Diamond Sure’ instrument, which refers any diamonds which might be a Type IIa and Type 1aB for further testing. These diamonds are susceptible to colour enhancement by high pressure high temperature (HPHT) treatment and require further testing to determine whether their colour is still natural. A test on the FTIR spectrometer is carried out to eliminate any referrals which may be due to other causes, such as heavy inclusions or the stone being a moissanite or other diamond simulant. Further testing is undertaken on the Raman spectrometer. The diamond is cooled to -196°C in a sealed cryostat using liquid nitrogen and a reading is taken using a 514nm argon laser. The resulting spectrograph is then scrutinised by an experienced gemmologist who is looking for specific telltale peaks, which indicate that the colour of the stone has been enhanced by HPHT treatment. If the stone is found to be treated it will still be graded but the certificate will clearly disclose that the stone has been HPHT processed. 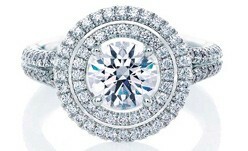 The value and appearance of a diamond is also influenced by the shape or cut of the stone. The stones may be cut in a way to give the optimum brilliance, fire and scintillation, or in some cases the cut is compromised to retain weight. Loose diamonds are measured on a Sarin DiaMension machine, which scans the diamond and delivers the accurate proportions. These will be unique to that particular diamond and will be reported on the Diamond Grading Report. The GIA cut grade is also assigned to round brilliants using the DiaMension, with the expert intervention of the diamond grader in assessing the finish proportions, such as polish, symmetry, girdle thickness, and culet. Assessment of colour and clarity is carried out under a special ‘diamond light’, which is a daylight equivalent lamp that provides consistent and appropriate illumination for the grader to grade the stone. The clarity assessment is conducted using a 10x magnification loupe, but if the grader identifies anything that needs further investigation the stone will be examined under a microscope using up to 40 to 120x magnification. Treatments such as laser drilling, to permit the bleaching of inclusions, can be seen using the 10x loupe, but more sophisticated treatments such as internal laser treatment (KM treatment) can only be properly identified using a microscope. Other treatments such as fracture filling can also be identified by skilled graders with a 10x loupe. These diamonds are not graded for colour and clarity as the treatment is not permanent and may change in time. Once the gemmologist has identified the inclusions and is satisfied with his or her assessment, the final grade will be set according to the view under the 10x loupe. The clarity grade depends upon five factors relating to the inclusions visible in the diamond: their nature, size, quantity, colour and ‘relief ’ (how evident they are). If disclosable treatments have been identified they will be noted and included in the final report. 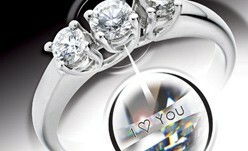 If a full report is required then the inclusions in the diamond are shown on a facet diagram on the certificate. The gemmologist will use a microscope to accurately place the characteristic inclusions and plot them onto the diagram, but will only show the inclusions visible under a 10x loupe. Making a stone look cleaner can hugely improve its attraction and therefore its apparent value. Laser drilling to remove inclusions has been a common practice for years, but is easily detectable as it leaves an obvious drill hole which acts as a conduit for a strong acid to bleach the material or to remove it all together. This may or may not improve the clarity grade but makes the stone appear better by making the dark inclusions look white. However, the latest internal laser or ‘KM treatment’ does not show the traditional surface reaching drill hole. KM (meaning ‘special drill’ in Hebrew) laser treatment uses diamonds with dark inclusions near the surface and causes a small cleavage to develop or expand around the inclusion. Once the cleavage reaches the surface (now termed as feather) it acts as a conduit for acid to bleach the dark inclusion. Irregular wormlike channels are used to widen the cleavage to facilitate the entry of the bleaching solution. An experienced gemmologist can detect this treatment with a powerful microscope. Identification requires careful examination using different lighting techniques, but the treatment can be recognised by the presence of a transparent, mirror-like feather that contains unnatural-looking irregular channels and a connection of the internal inclusion to the surface of the stone. Colour grading is carried out by carefully comparing the colour of the diamond against a set of diamond master stones certified by GIA. AnchorCert uses masters at the top of each grade, so for example its highest colour master stone is ‘E’ colour. Any stone more colourless than this is graded as ‘D’. If the stone to be graded is mounted, the diamond grader will hold the master stone in an appropriately coloured stone-holder to try to create as fair a comparison as possible. Grading mounted stones requires experience and good judgement, but is inevitably more of an assessment than grading the loose stone, and the grade may be shown as a split grade – for example H-I instead of a single grade if it was graded loose. One of the most significant and successful treatments to improve the colour of a diamond is to subject it to high pressure and high temperature (HPHT) – a ‘permanent and irreversible’ treatment which caused uproar when it first emerged in March 1999. This treatment was developed by General Electric Co and significantly improved the colour of brown type II A diamonds to colourless, and to such an extent that they were ‘indistinguishable’ from natural colourless diamonds. The HPHT treatment also produced yellow and yellow-green colours in certain types of diamonds. Colourless type IIA diamonds immediately became a cause of concern for the diamond market; were they treated or not? De Beer’s researchers worked feverishly and they pinpointed several characteristics to help to identify the HPHT treated diamonds by using photoluminescence (which is carried out by the sophisticated Raman Spectrometer) and absorption spectroscopy. Despite their best efforts, no one has found a way to identify HPHT diamonds without the use of extremely sophisticated instruments such as the Raman Spectrometer which is only available in a very few laboratories worldwide. Fortunately for the UK trade, AnchorCert Gem Lab can provide this identification service, and regularly reports on large white type IIA diamonds. The fluorescence of the diamond is checked under long wave ultra violet light and is reported on a Full Diamond Grading Report. It may be reported as faint, medium, strong or very strong. Once the full grading of the diamond has been completed by the first grader, the entire process is carried out again independently by a second grader, unaware of the results from the first grader. If the two opinions do not match then a third grader will be asked to adjudicate. It is only by this continual independent benchmarking that a consistent standard can be maintained. Once all these processes have been completed, the results are compiled, giving the jewellery industry and the consumer the reassurance of an independent, expert AnchorCert Report.